Within the framework of our discussion in the importance of border security in the age of globalization, I chose to examine first the concept of globalization and from it, I will try to examine the issue of the importance of safe borders. Globalization – is the broadening of political, cultural and economical connections between nations, companies and individuals, in a way that creates a combination of monetary, cultural and political movements, all over the world. Products, people, money and technology, cross national borders in a rapid pace. This phenomenon causes the creation of a broad community, combined into a single market. One may argue over this definition, but I prefer to relate to it as it is. To me, it describes in simple wording the true ongoing situation. All of the elements that appear in this definition are obstacles towards the establishment of safe borders. We shall examine the main elements related to the importance of border security in the age of globalization. There is no doubt about the contradiction between geographical and political borders, and we shall relate to the reality in which the physical borders become "transparent". The globalization process – is a change in the field of computerization and communication (PC, satellites, cellular phones, and the internet web). They enable communication between nations and continents. Thus, creating cultural, political, and particularly economical relations between different states and most importantly – between individuals and groups in different states. The weakening of the nation-state – The occurring changes of the past few decades have brought loss to the nation-state's power, though there is no consent over who got this power. While some researchers claim that it is going to transnational political organizations, such as the European Union, or the United Nations. Others claim that the entire political system is weakening and the power goes to other systems, mostly to the economical system. Communication – Worldwide media networks and television broadcasting via satellite. These transmitting sorts, unlike their predecessors, are not controlled by the state, which in most cases, could have never put censorship upon those sorts. International crime – The same technological changes that enabled the forming of international corporations also enabled the making of international crime. Same as CEOs, criminals do too make their activity more efficient and turn it into transnational by using cell phones, satellites, and e-mail. The international financial trading enabled international money-laundering for the purposes of terror and criminal-acts financing, which have been made very difficult to find. The world of crime has turned global too, thus challenging the ability of a state to cope with them. The weakening of the state in this field was in the two matters which were described on the above. On one hand, there's the transfer of power from the state to the international crime-fighting organizations, such as the Interpol, which do not become into a dominant, leading organization that influences on the global level. On the other, the nation's lack of success in taking care of crime is thought to be a hit in the secure feeling of its citizens, which leads to lack of trust by the citizens. International terror organizations – Globalization has enabled the forming of international terror organizations, especially Al-Qaeda, World-Jihad and their likes. 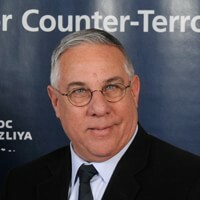 Cooperation and information transferring between terror groups have become so powerful, that they don't hesitate to declare war, even upon states.Of this definition we learn that the national borders lose their meaning to global borders, which are drawn by pacts and agreements between international corporations, who have versatile interests. A more severe phenomenon is the fact that international terrorist and crime organizations have begun behaving and organizing as international networks and pretend to be legitimate citizen corporations. The changes in reality in which globalization is more involved and influential within life's routine, obligates to test those influences over the private person and over his security feeling. There is no doubt about the on-going growing importance to define borders for security purposes, as the threats over the personal security are growing. As a person, a problem has began in my personal security feeling, in a way that I am not sure who are my allies and who are my enemies and who is in charge over my personal security. Of my experience as a citizen, I have come to know that the terrorist that made those bombings in my country looked like me and you and sometimes like the kind neighbor. For sure, this does not add to my feeling of insecurity. So, I keep the safety of my own territory: my house and my yard, with the feeling that I need to take care of me beloved, and not trust so much on the authorities. I have locks put on the doors, have an electronic alarm system against thieves, fire etc. and I have the content of the house insured with high expense. I pay to a security company to arrive quickly to my home, if the alarm goes on. My house is surrounded by a fence or a wall, which too operates with electronic systems. No one is allowed to enter my house without my approval, I check on the intercom who is it that seeks to enter. I make sure that the politicians who represent me shall legislate better and tougher laws, for the benefit of my personal security. In certain places in the world, by law, I am allowed to shoot whoever that enters my private territory without consent. As one of the public, I expect those who are responsible for my security to at least use the same means as I do, in order insure my security as a public, as the way I hold in my private area. "A public", is in the meaning of citizens, of course, who share a state and yearn to have a strong security feeling for themselves and their surroundings. 1. The border must be secured against any unwelcomed disturbance to the agreed territory. 2. A secure border must protected from terror and crime altogether, all the roads that are in the use of criminals, are too in the use of terrorists. to maintain any laws and rules for a secure border. 4. An aerial, naval and land defense space, and in the near future also in the space. 5. There is no 100% secure border, for there are rockets, media networks and the internet. 6. The organizations who are responsible for border security, crime and terror (Terrocrime) foiling on the global level, are doing there job insufficiently. 7. Intelligence is the most important tool for terror and crime(Terrocrime), and is not put in good use on the global level. 8. The power of a single state to fight terror and international crime is weakened by the day. 9. The best examples for control and global action are in private finances, industry and economy. A border must stand as an obstacle and a check-point to hold and react to any action on the agreed territory. "An agreed territory" is the array of borders that is different than the political borders, which derives from an alliance between states that act in a synchronized way against those phenomena. Most important and critical is an international decision on relating terror and crime as a single unit.Organized crime and terror organizations use the cracks in the international coordination and synchronization for their own benefit. Coordinated actions against terror are required. There is a need to agree and legislate the global definition of: "what is terror and what is a terror organization?" Then, we shall try to make international laws to fight terror, and define effective, secure borders, which can prevent and foil crime and terror actions. We all know for certain that to this day, all of the international laws are liable only to the definitions of states and not organizations, in a way that it is a problem to act on the international level against terror organizations who act from a state's territory, such as Hezbollah in Lebanon. Space is too starting to become crowded. More and more nations are acting and use civil and informative means very freely. Not far is the day when conflicts between states will emerge, and then too we shall have to also expand the definition of globalization to this field. There is high and crucial importance for a determination of borders' nature between states and relate to the method of defense and means that we will be eligible to operate. We see in Europe examples of open borders between states, or low-controlled borders, and we also can see closed borders, regulated by the state's laws and decisions. As far as I know, there are no joint rules regarding border security that define exactly who is a suspect, who must be checked on a high level of suspicion, and who isn't. Also, what sorts of means are security forces eligible to use to maintain border security? There is no unity and no global thinking of who are the problematic passengers in our borders. There is no body or organization that bares the responsibility for "marking the bad guys" along an international pursuit after them, while "passing the Baton" from a state to a state, and from an organization to an organization. When I take a visit to the US, I apparently seem as a safety hazard, and go through all of the strict security checks in each entrance and so with any flight within the US, even when I am invited by the official authorities on the matters of security, terror and HLS. In other countries, I don’t seem as a special hazard, and go trough routine checks go through open borders, and don’t feel any difference between me and a local resident. An American citizen, coming to Israel, is going through accelerated checks, like an Israeli. From this example, I think one can learn about the difficulty of the subject of "The Importance of Border Security in the age of Globalization". On air, sea and on land. A security fence and an enforcement system are a pretty efficient obstacle holdback. In Israel, the establishment of a security fence took the amount of terrorist attacks drastically. In the north, from 162 attacks in 2002 to a single one in 2005. One must remember that a fence without an immediate real-time response force is useless. The weak points of the fence are the passages and check-points. It is impossible to check each and every one, unless one holds back many people and vehicles for hours and even days. There is a direct connection between crime and terror which enabled terrorists the use of smuggling routes, and so, on the drug-smuggling routes we find weapons and explosives, and whores, sitting on top of the explosives. All of the terror organizations are constantly trying to put their hands on danger materials and WMD. There is no certainty that those materials are not already being smuggled in those routes and being stockpiled for extreme usage. We are expected to run into a new kind of suicide-bomber, carrying viruses in his body, spreading them. At the moment, there is no true ability to locate materials in the check-points. There is no true chance to discover those new suicide-bombers in the check-points. The time needed for the required security level is too long, and not realistic to manage passengers and cargo in the check-points. Does a new-required technology already exist? Because of the sensitivity of the materials and the ease of making negative use such as crime and terror, there is a need to act by a principle which obligates supervision over the materials, the shippers and the suspects, once they are starting to move. In any time, there's a need to know where the material is and who is allowed to ship it. The supervision must be on a same-basis global-seeing cooperation. International laws are required for method and security obligation for dangerous materials, from theft, sabotage or explosion. The supervision above those substances begins much earlier, and we need to follow the cargo once it has left the manufacturer or the supplier. Any deviation or problem that stems out of treatment, mobilization or the sell and manufacturing of dangerous substances should be reported and sent to all the people who are involved, without taking under consideration the physical boundaries as evidence of the common interest of global security. The most important and problematic need for fighting terror and crime in each country is much more harsh in the global aspect is intelligence. We collect intelligence like a "vacuum cleaner", but we have a problem to filter value and transport the intelligence products on the spot in order to perform an active operation. Today we don't entirely trust each other and despite of the passwords there is no real cooperation between countries. Because the intelligence organizations have an intimate character…their obligation is only for their own country, for well defined interests that were defined by the organization law or by intelligence's work program. Of course in every work program there is international cooperation on the line, isn't it? Today we have a problem to decide who will be responsible for the intelligence issue. Who will collect, process and determine what intelligence substance will be transferred to. Where would the line go through? How will we built a closed and secret system that works in an open way towards all the organizations involved? Same goes to the private economical global organizations. It seems to me, by experience, that organizations like militaries and Interpol cannot be the mechanism that will lead the change. Terror and crime organizations take advantage of the situation, the lack of global cooperation, and know exactly which organizations and states work in true and efficient cooperation, and perform "bypasses" through weak points. In Israel we know the phenomenon of transferring crime and terror from the Gaza strip, though Egypt into Israel, through plains that are not protected by an efficient security fence. As an example for problematic cooperation, even within the state itself, one can see that in Israel, the organization responsible for terror-intelligence is the Shabak, and by the Shabak's rules, the Shabak cannot deal criminal information but only in matters of terror. But where does the bare line between crime and terror goes through? We all know on a proven level that there are no special different routes for terror and even that those who pull the jobs aren't different, and are willing to smuggle everything that will give their organization funds and power. Neither NATO nor the UN, to tack the lead thorough and efficient fighting against crime and terror in the expanding global topography. There is no doubt that the present organizations and the security structure, are not efficient as needed. Armies do not have the knowledge, sensitivity and flexibility to treat terror phenomena. There is a need for abilities and a classic, investigational skilled police work, and for special units, alongside terror and severe-crime skilled information organizations. Altogether with their information gathering subjects, they shall have, by law, the responsibility to gather information, evaluate at spread it. All that must work in most efficient matter and on realistic time patterns which normally do not enable organizing and transferring a skilled unique fighting power from country to country or from continent to continent. We can see clearly that the international civil sector succeeded in doing the required adjustments, in order to act in the global reality, in a precise and efficient matter, while formal organizations are still way behind. Today I can shop, transfer money, or anything that comes to mind through my desktop, and all that is in a reasonable secrecy, which does not give away my secrets. So, if we are required to efficient our treat to security and borders in the global age, it would be correct to take an example from the international corporations that were built in the needed flexibility and have greater achievements. I've thought of a model, which I call "FEDEX". We can use 4 Grams of Heroin as an example. In any situation that this amount of drugs won't be covered, so will any dangerous materials and weapon of mass-destruction. We must think very seriously of other structure of information-services cooperation and other operations for Terrocrime-fighting. Our job is to find a way to make an international structure such as FEDEX, which knows wherever and whenever each package of their services is at any moment of time. The procedures have the knowledge to difference between the regular deliveries and other special treatments etc. FEDEX develop efficient solutions to any special demands from their costumers and keeping their confidence. Working with large number of clients is not an issue to FEDEX, not even if there is a competition between their customers. We need to test this model and try to fit FEDEXs' principals into the real world of terror-fighting in a global way. We are demanded to "target" suspects (in terrorism) or target known terrorism, drugs and weapon dealers, money-launders and follow them wherever they are in the world. We need to find a different and effective way to do so and have a global cooperation regarding that those targets. Also, we need an international force which will be ready to "go" at any time and will have a world-wide police orientation. For that an administrative international body should also be chosen, it should be accepted and supervise according set of international rules and regulations that permit and obligate to act by new codes that are not only human rights and civilian, but also world existence war, because the war against terror and against unconventional terror and the array of partnership between them and the international crime, could become a horror movie in an instant. 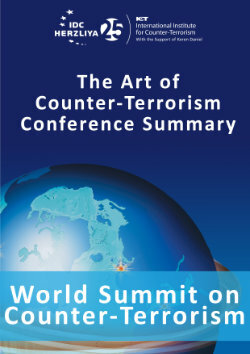 You could be impressed from the volume of the illegal and terrorist activity in the world by the many characteristics and we all will understand that this website must be one of the screens in the center of the international control of the responsible body that manage that global war, because we should assume that there is a connection between several events that occur in different places across the globe. And still, there's a long road ahead.